A game overview and review by John Zaenglein. Stonemaier Games took Kickstarter by storm in 2012/2013, setting the new standard for how board game campaigns should be run (this isn’t hyperbole – Jamey Stegmaier’s library of blog posts on all issues Kickstarter are regarded as holy text for any creator trying to run a campaign without the luxury of a mega-publisher behind them). Euphoria was the second of their projects (the first being Viticulture), and raised an obscene amount for a non-miniatures offering. It’s a worker placement game with an amazing theme seamlessly integrated and a whole bunch of gameplay goodness going for it. Here are some of my opinions on it. While gameplay is quite smooth and breezy, set-up is anything but. There are bunches of different wooden pieces, cardboard pieces and cards to separate and arrange prior to playing. In fact, when you first open the box it’s a mess. The box itself lacks any kind of insert – you just throw all your stuff in randomly (I’m not sure if this is the same with the Deluxe or Premium additions). There’s a bunch of plastic bags provided for you to use to separate the different bits, but there weren’t enough for me. When I open my copy now, I’m greeted by 20+ separate baggies containing parts. That’s usually a pretty big buzzkill, but the game is so fun I try to ignore it. In direct contrast to the disheveled box is the rulebook; while it’s no easy read due to the amount of material to cover, it’s well organized and likely as concise as possible. It took me about 2 hours to have the first game ready to go; after that, it takes about 15 minutes to set up. The advertised play time might be a little off for a 5 or 6 player game, but not by much… while there are constant decisions to make, there’s not too much others can do to curtail your plans. This can keep the analysis paralysis to a minimum. By the end of one game you’ll have the rules down as well as a fair amount of strategic depth. Euphoria isn’t a game that you stew on and hone your general approach to through your first 20 games. You’ll know everything you need to know to give winning your best shot by your 3rd or 4th game. Teaching it to others isn’t easy, though. The way I’ve been able to handle it best is to run through the thematic first then go through the rules of each “turn”. At that point, I’ll start playing and let new players pick it up as we go. This takes about 30 minutes. I’ve tried explaining things in detail for an hour, and I just get a bunch of blank stares and “that doesn’t make any sense”s. Euphoria supports 6 players out of the box, and works great with that many. This is (unfortunately) a rarity, and very appreciated. But some people just don’t like worker placement games. If you have somebody in your group that hates Euros in general and worker placement in particular, but never seems willing to try one, this might be your best shot at convincing them. The theme is so ingrained and dominant that they may not notice… and it can’t hurt that you’re placing dice instead of meeples. If you play the game without telling the story, there is nothing objectionable. But there is something decidedly mature about portraying a totalitarian regime and giving the players the choice to work within or rebel against it. Oh yes… one of the more clever embellishments of the game is the “ethical dilemma” cards – at any point in the game a player may use their ethical dilemma and announce whether they are rebelling or conforming. It’s usually more valuable to conform (you automatically place one of your 10 authority tokens – placing all 10 wins the game)… but it just feels wrong. I can count on one hand the number of times players in my dozens of games have chosen to conform. That’s how you know the theme works and is being received by the players. It really would lessen things greatly to avoid “telling the story”. In any event, it is a complicated game and probably not one that you’d pick for a child before 12 or so. Euphoria borrows the dice-as-workers core of Kingsburg with only subtle modifications. While Kingsburg (and most other games) favor high dice rolls, Euphoria generally favors low dice rolls (you want to keep your workers ignorant, and the face of the die represents their knowledge). If you ignore theme, though, the two games can feel pretty similar (Euphoria is certainly more complicated). There’s also a little Lords of Waterdeep here, in committing your resources to open new buildings on which your workerdice may be placed. Euphoria should be a staple of any Euro gamer who has trouble interesting their friends in lighter-themed fare. I love the game, but there are a few drawbacks I wasn’t able to work in above that I want to mention. While it doesn’t distract from gameplay for me, some of the dice are completely misshapen. This is quite odd… you can place them next to each other and see that one is shorter than the other, or oblong instead of square. They also avoided creating enough wooden resource pieces for the game by including a “multiplier” board – if you earn 3 of the energy resource, you would take just one of the corresponding bits and place it in the “x 3” section of your multiplier board. While I understand this helps a small publisher save on costs, it is definitely more confusing than just grabbing 3 of the necessary resource. And the “storage system” is really awful. Just throwing a bunch of baggies in loose with the board makes me feel uneasy every time I pack it up. Fun Factor: I have wanted to try this game out for quite a while and finally having gotten to play it I was pretty disappointed in it. There are several systems in this game that could have been great if they would have been further developed into something more. Sadly this game does not deliver any depth of strategy or idea, it’s all on the surface. I am a definite fan of dice as workers and so this game had that as an intriguing idea but sadly it simply went with “higher is better” expect in one exact situation. The idea that you want your people to be smart but not too smart (higher numbered dice are “smarter” workers) was a fun concept that was fumbled here. There is a track at the top and you add your total dice to the number on the track, if too high you lose a worker. But this track has no other reason for existing. I had assumed that you would add the number on the track to your dice making them “smarter” but carrying the risk of losing a worker. This did not happen, it’s just a penalty track. I think this is a good example of the entire game, there are so many systems and chunks of the board dedicated to a single concept when it feels like they should offer and handle more than that. Replay Value: Not much of replay value here. You get some randomly drawn cards at the beginning of the game and that’s about it for changing this game. Everything else is just going to be “did I roll as good this game as last game”. There aren’t really any different strategies that I saw at play and no real way to build into anything so you just want the highest numbers as often as possible to get the best/most parts. Components: Here’s the biggest upside for this game, every component is amazing! All the wooden pieces are carved to match what they are representing and its really nice to look at. I am a big fan of the digger meeple, he looks awesome. The box is also large enough to support good organization methods which is a good thing. Learning Curve: I ended up reading through the rulebook here several times because some things in this game just don’t work the way they look like they would work just looking at the pieces or sections of the board. The above mentioned worker intelligence is a good example of this. We also ended up having to go ask another guy at the store we played at, who had previously played the game, how to do some parts because it just wasn’t clear at all. Verdict: I really wanted to like this game, I loved the idea that you wanted smart workers but had to balance how smart they were but it just did not pan out. I found that there wasn’t much strategy to be had in this game. By the end it felt like the role of the dice ruled everything. I can’t recommend this one at all. If you are looking for something with these ideas I recommend Castles of Burgundy. I really wanted to love this game, the artwork and components are in top quality, the mechanic is somewhat a unique blend from several mechanics. But my first play denied me that chance. I dislike racing games and this one is a racing game from skin to bone. The first player who placed all of their stars, win the game (close enough). So whoever get rid of their stars will highly win the game. In this game you will support some factions and will drive factions toward progresses. You will have workers in the form of dice and can recruit more or even lose some. During your turn you will assign one of your workers to a location, to gather resources, getting new workers, build markets, dig tunnels and more. You also have two recruits and a secret agendas. One recruit will be placed face up and active since the start of the game while the other is placed face down, secret from other players. This recruit can only be declared once it’s corresponding faction reach a level where they must be revealed. These recruits give you certain benefits and also possible Star placement (if the faction reach the highest level in the faction track). Also players can complete a secret agenda by paying with artifact cards, in which players will need to choose whether they want to place one of their star or get a new recruit card. Other ways to place stars are with participating in the construction of markets (where having a star there will protect them from a detrimental effect the market triggers when it’s built) or by placing them on artifacts in certain places around the factions. So in short, players will gather resources with workers and spend these resources to get other resources (workers included), cards or place stars. Players can also lose workers when their dice roll exceeding the allowed knowledge limit which can be adjusted by doing some things. So players need to be cautious to get their hands with more workers than they can chew at a time. There’s a unique mechanic where players, aside from allocate dice, they can also retrieve them back from the allocated spaces (from one die to all) to be able to use them again in subsequent turns. After retrieving the dice, they have to immediately roll them, which will be evaluated whether the total amount exceed the knowledge limit or not. If exceeded, that player needs to lose one or more dice so the amount is equal or lower than the limit. Also there are some locations where players can kick out other player’s die in that location, which can also resulted in losing a die for the owner’s of that kicked-out die, for he must immediately roll the kicked-out die and check the limit. I found the game very interesting, smooth and very engaging. Though this smoothness somewhat omitted some real and meaningful decision in each player’s action, but it’s very streamline and simple. You can feel that your play is progressing by getting more benefit from factions’ progress but definitively it’s a racing game, which I pretty much dislike. So once the winner is decided, it’s kinda anti-climax or turn off the feel. It’s hard to change the situation (which reminds me of Istanbul) once you’re in, and the game play doesn’t feel rewarding if you lose the game. It’s kinda pointless when you lose, since the process are kinda dull and flat though simple and streamlined, for the sake of your purpose to win the game. So whatever sweet things you get from playing it, the after taste turns all of those to sour. I don’t say the game is bad, it’s just not working for me. I enjoy the game play, just not the result (unless you’re winning of course). Let me compare this with Lewis and Clark. It also a racing game and yes the winner often can be decided early on before the game ends (anti-climax) but I don’t feel sour when lose, I feel rewarded by the clever plays during the game, the efforts, the struggle to keep moving forward, the puzzles between the corners of your mind give you all of those sort of accomplishment. So yes, that’s my issue. Aside from that, the retail copy has good component quality, even better if you have the KS exclusive copy with realistic resource tokens. Right off the bat, this game is beautiful. The artwork is stunning and fits the dystopian theme perfectly. Not only does it look good, but it is also a joy to play. It is a worker-placement game where you win by exerting your power and being the first to place your ten authority tokens. Each player has their own colored dice that serve as their workers with their intelligence represented by the value of the dice (from 1-6). Smart workers can be beneficial in expanding your totalitarian regime, but will revolt against you if they become too wise to your schemes. A great thematic concept that is well executed in the game mechanics. It definitely takes a full play through to get a sense for all the various tasks that you order your workers to accomplish. But by the end of the first game you will already be looking forward to how you might trade, tunnel, and trick you way to victory the next time. There is a fair amount of strategy with a healthy amount of luck and player interaction that makes it a perfect game for seasoned gamers and casual gamers alike. After a few play-throughs, it felt like it supported a variety of strategies and pathways to victory, giving it a high replay value. Highly recommended for those who appreciate a impressively-designed game with a desire to brain-wash their opponents. Bonus points to Stonemaier Games for being responsive and sending me a single replacement worker-die after it was chomped in half by a hungry dog. All I had to do was fill out the form on their website and a week later, there it was in my mailbox. 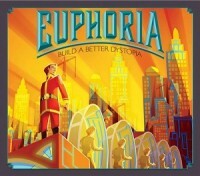 Add a Review for "Euphoria: Build a Better Dystopia"